This 2-channel analog video mixer makes your video and audio come alive through various stunning digital effects. Any one can create real-time video transition and key effects for excellent performance with professional-level effects. This video processor will correct video timing errors and restore the pulse, color burst and jittering found during the playback of a damaged video feed and reconstructing the distorted images for stable and smooth output. So no more jagged lines or rolling pictures seen from the screen display. In addition, the color level, sharpness, tint, brightness and contrast parameters of the input signal can also be manually adjusted by users during the video capturing or playback. Digtial effects such as strobe, mosaic, paint, still and negative can be applied to both video channels. Size and position of the effects can be adjusted with the joystick. This digital effect A/V processor is also featured with composition effects such as picture-in-picture, Chroma key and Luma key capability. Its comprehensive studio digital effects such as mosaic, strobe, paint, negative, wipe and fade effects are all great tools to be used during video capturing and video editing stage. It can effectively wipe, dissolve, fade and make transitions between video/audio segments. All the audio and video transition levels between A/B sources are easily managed through the slide controls on the control panel. 4 video pass-throughs: 4 composite loop-through for all video input channels. This is designed for helping users monitor each input source before transition applied. This video processor is also served as a full-frame time base corrector featured with dual channel frame synchronization with full frame memory. It will sample the input video feeds into its memory buffer in real time and then correct all frame timing errors and level variations before output with new solid pulse and phase clock. This processor also helps eliminate incorrect timing pulses which make images look too light or bright and reprocess the video signals back to standard broadcast signal again. This video processor also supports color correction. All the color level, sharpness, tint, brightness and contrast parameters of the input signal can also be manually adjusted by users during the video capturing or playback. This helps users correct all color elements of video signal or create artistic effects for better visual entertainment and high impact multimedia presentation. The color correction feature of this unit allows you to adjust the color balance when the auto color balance in your camcorder or media player has failed to act as expected. positioning the PIP video window location to anywhere on the screen as needed. controlling the center wipe effect to be applied on areas of the screen to achieve the desired video channel transition results. applying all other digital special effects anywhere on the screen as needed. This multi-function video mixer also supports PIP function for displaying two video channels on the same screen at the same time. With PIP support, users can view two video sources on the same TV from sources such as VCR/DVD players, camcorders, satellite receiver box, computer, CCTV surveillance camera or other A/V V systems. Users can assign the input channel for the PIP sub-video window. The PIP screen size can be controlled through the push buttons for 1/2, 1/3 or 1/4 of the screen located on the control panel. Users can choose whether PIP screen to be shown with or without border lines. The PIP screen location can be put anywhere over the main screen by using the joy stick on the control panel. The PIP screen can dissolve into the background scene. These video mode control keys in this section allow users to select the type of transitional pattern to be applied in the progress between A/B sources. All transitions are easily managed by using the A/B slide control located in the Video Source Select box. These buttons allow users to select a variety of wipe patterns, PIP modes and color key selections. Some of the buttons in this section are marked 1/2, 1/3 or 1/4 indicating multi-stage operation. Each time users press such a button it advances to the next stage. WIPE mode: Replace one source with another using a variety of wipe patterns available from the "FUNCTIONS" panel. There are option for the shape of wipe pattern such as straight wipe, corner wipe, split wipe, square wipe, diagonal wipe, triangle wipe and multiple wipe. PIP (Picture-in-Picture) mode: This mode allows users to insert a smaller video sub window from the secondary input (source B) to the main screen displaying the main source A. The PIP window can be positioned using the joystick control and the A/B slide control so users can have the PIP window fade in and out. The PIP window sizes are available for 1/2, 1/3 and 1/4 of the screen size and can be shown with or without a border selected in the function box. MIX mode: Users may use this function to dissolve/transition from one input source to another smoothly and gradually using the A/B slide control. KEY mode: Replace one source with another by keying on a pre-selected color (Blue key) or brightness (Luma key). For example, when keyed on black, Source A would replace source B beginning with all black areas of color and progressing to a complete transition. The slide control adjusts for color intensity or brightness to optimize keying the function buttons (Blue and Luma keys). Each has two settings, so you can replace the blue with the other source or replace everything except the blue with the other source. A Source and B Source buttons let you select which source is used to key. Auto Fade/Wipe mode: This is used for performing the wipes and fades automatically at the speed defined by users. Press the ON button to activate the AUTO WIPE control. Press the START button to execute the transition. The speed of the wipe is determined by the setting of the control slide located in the Video Source Select box. Fade/Wipe transition time can be adjusted by operating the slide bar, selectable between wipe or mix effects and has a auto wipe/fade control. The manual push buttons on this section of the control panel will allow users to select various wipe patterns, PIP modes and color keys. Some of these buttons are marked 1/2, 1/3 or 1/4 indicating there are two, three or four levels of special effects available for mixing into the operation. Each press of such a button advances users to the next level of effect selected. These function control buttons are also color coded in coordination with the color-coding on the buttons in the video transition mode section. For example, when the purple WIPE button is selected from the mode control section, all the purple color buttons in this Function section are available for operation. The MULTI SCREEN button here provides a variety of unique wipe patterns including diamond shapes and window-blind effects but it only works while set in the WIPE mode. 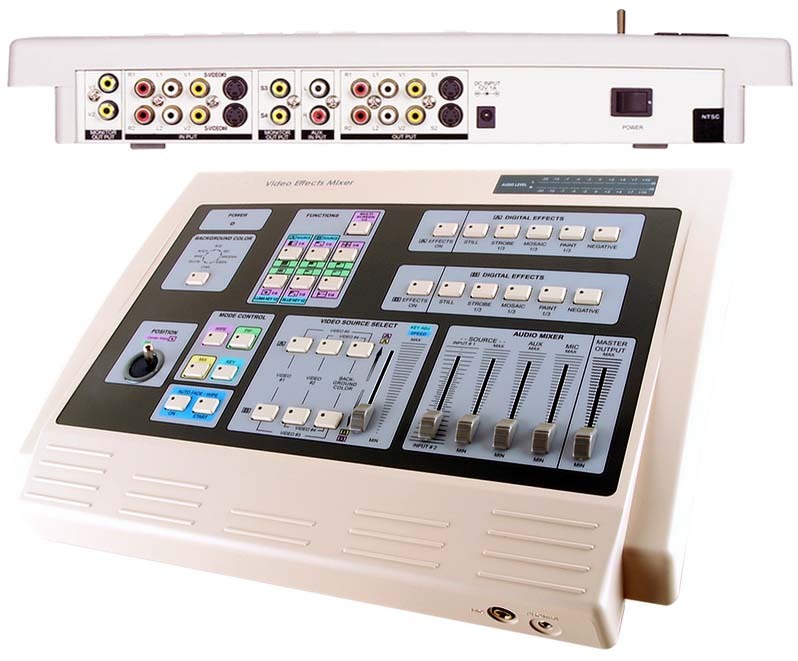 This special video mixer processor provides total of 5 digitally generated special effects that can be applied to video images from source A, B or both.All special video effects can be used alone or in combination. All of the effects can be turned on or off by pressing the EFFECTS ON button. The red LED light indicates which effects are selected and whether they are turned on or off. STILL: The STILL effect freezes the picture on the screen but the audio track continues playing. Press once to select STILL, press a second time to turn off. The red LED is on when the STILL effect is selected. STROBE: The STROBE effect creates video stop-action effects. Three STROBE speeds available. Press once to turn on STROBE at high speed, press 2nd time for medium speed and press 3rd time for low speed. Press 4th to turn off. MOSAIC: The MOSAIC effect breaks up the video image into tiny square patterns so to make the selected image area not recognizable. Commonly used in disguising identities of the objects. There are three sizes of MOSAIC squares available for selection. PAINT: The PAINT effect (Posterization) merges shades of colors and creates an abstract type of picture. Three levels of intensity are available. NEGATIVE: The NEGATIVE effect creates a negative image of the video selected. Press once to select NEGATIVE and press a second time to turn off. [Note]: These effects can be combined. STILL or STROBE can be used with MOSAIC, PAINT and NEGATIVE. Select several effects at once and apply when desired by pressing the EFFECTS ON button. This digital video effect processor is a stand alone video overlay solution. It is equipped with both Chroma Key and Luminance Key. Keying allows isolation of images and superimposing one image over another, great tool for all multimedia applications involved with creating composited video effects to be used in education, advertising, media center, video studios, wedding video graphers and all post production related tasks. A typical use for BLUE KEY edits is when news broadcasts superimpose a weather map behind the weatherman, who stands in front of a blue background.LUMA KEY keys on the brightness levels. BLUE KEY keys on a specific shade of blue. The background color control button allows users to select one out of the 8 color keys to use in wipes and edits keying on colors.Available color choices are BLUE, RED, MAGENTA, GREEN, CYAN, YELLOW, WHITE and BLACK.The wide range of background color keying selection benefits users for overlaying videos. Users can easily adjust for color intensity or brightness to optimize the keying effect through using the A/B slide control located in the Video Source Select box for the color key effect to take place. All-In-1 video mixer, time base corrector, special video effect generator and chroma key processor. Professional-quality mixing results with vibrant colors and crystal clear picture-quality. Standalone 2-channel digital effect generator to perform real-time video effects and transitions between A/B sources. Full frame time base corrector with dual channel frame synchronization with full frame memory. Designed for fixing jittering, tearing, twisting and line effects for stable images through dual-field full-frame reconstruction. Replaces and regenerates pulses through internal digital frame buffer for smooth output with optimal visual presentation. Restores color burst of the original video feed for optimum color and clarity. Eliminates brightening and darkening, blackout, color shifting, jitter, shake, picture tearing, twisting, line effects and all other symptoms. Color corrector function helps users correct all color elements of video signal or create artistic effects for better visual entertainment and high impact multimedia presentation. 2-channel full-field digital synchronization allows video/audio mixing of any two A/V sources in real time with no lags. Worldwide video system support including all NTSC, PAL, PAL-M, PAL-N and SECAM. Professional-style joystick control design for easy and accurate selection of screen areas for digital effects. Easy video transition level control with using the A/B slide control. Multiple video/audio inputs gives editors with versatile flexibility and options for video and audio source selections. 2 composite RCA video inputs + 2 S-Video inputs. 2 stereo RCA L/R audio inputs + 1 Aux input + 1 microphone input. 4 simultaneous video outputs + 4 video input loop-throughs for monitoring purposes. Supports overlay function with Blue chroma and Luma black/white key functions. Supports studio digital effects including Mosaic, Strobe, Paint, Still Image, Negative, PIP, Mix, Wipe and Fade effects during video capturing and video editing stage. Adjustable PIP position through using the joystick on the unit to relocate the PIP window for the 2nd video screen to be at any location on top of the main screen. Wide range support of wipe patterns plus 8 different selective background colors. Pro-style joystick design helps users with precise control about areas of digital effects to be applied on the screen for wipes and picture-in-picture operations. Audio can be processed either separately or in combination with a video source. One headphone output for private listening or monitoring purpose. Unlimited positing on the screen. 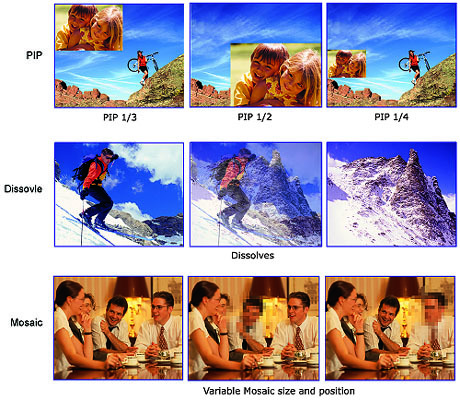 Video Standards Support: NTSC, NTSC 4.43, PAL, PAL-M,PAL-N and SECAM.